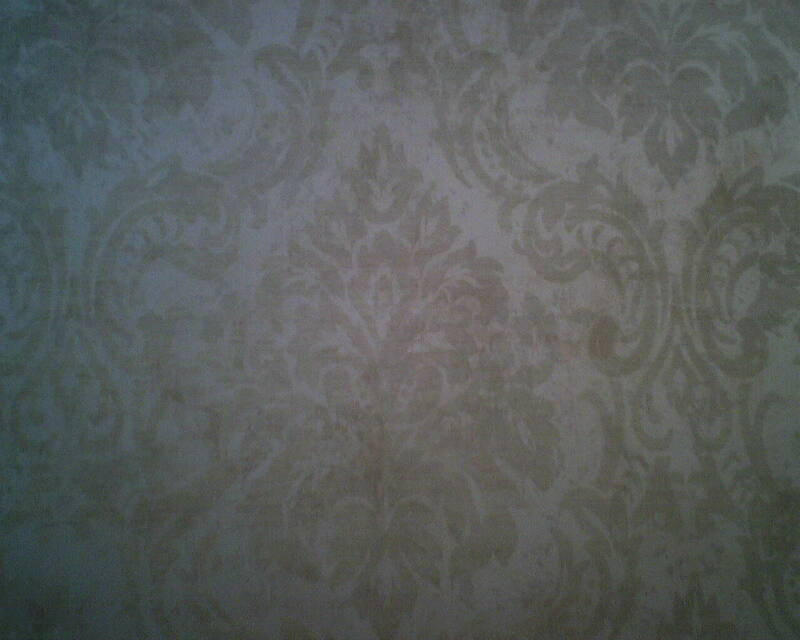 When you wallpaper a room, there is almost always a mis-match in the last corner, the point where the last strip of wallpaper meets up with the first strip that was hung. So I try to hide this in an inconspicuous place, like a corner behind a door, for instance. In this powder room in the Rice Village neighborhood of Houston, there were no corners tucked behind doors, so all the corners would be very visible, and a pattern mis-match in these corners might be eye-jarring. Sometimes, that’s your only option. But today, I got lucky with both a design and with wall dimensions, that allowed me to hide the mis-match in plain sight, so to speak. The area over the door was only 9″ high, and was not as visible as the corners of the room. So I opted to put the mis-match there. 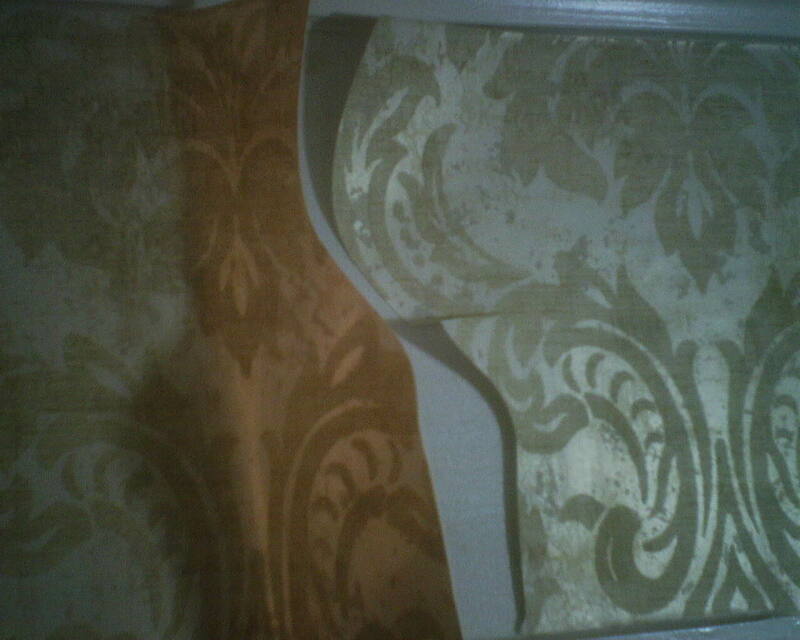 The idea was to splice two strips of wallpaper, each with different design motifs, together, to try to fool the eye so it would not see a mismatch, but instead would see an unbroken pattern design. 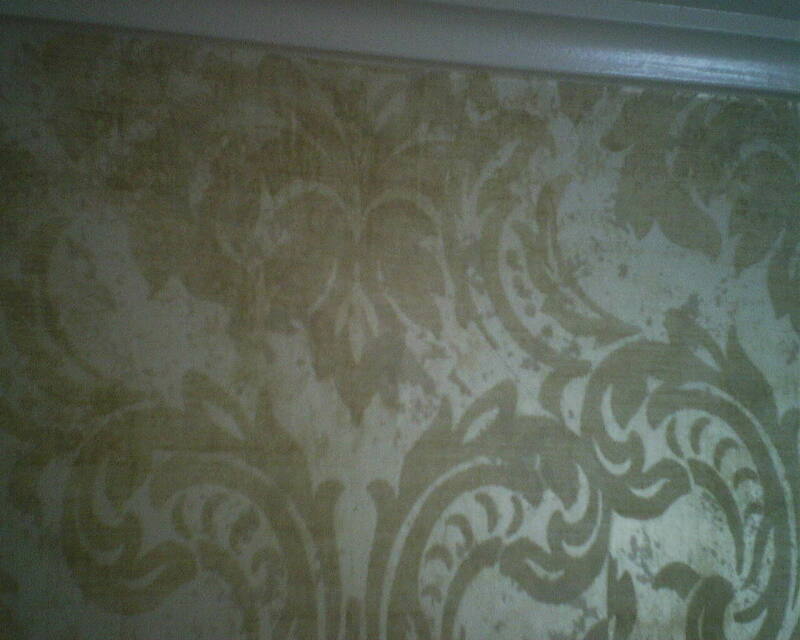 The top photo shows the wallpaper pattern (a damask) as the artist designed it. In the second photo, I am moving from the right to the left, preparing to meet the wallpaper to the left (not yet in place, so you see white wall). To prepare for the splice that will take place on the wall (which we call a double cut), I have padded the wall, to protect it, with a piece of scrap wallpaper. 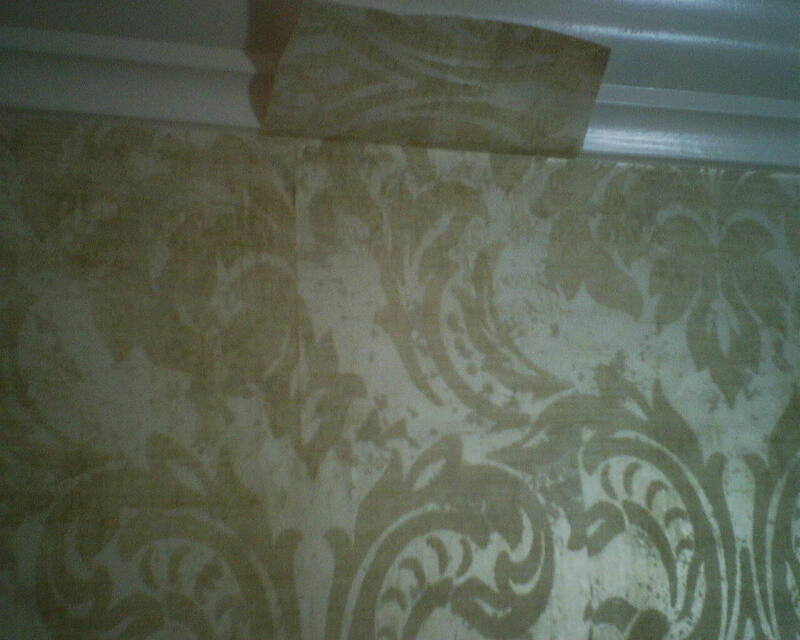 (It is important to not let your razor blade cut deeply enough to score into the wall, because an un-intact surface can yield to stress applied by drying (shrinking) wallpaper, and actually pull away from the wall. 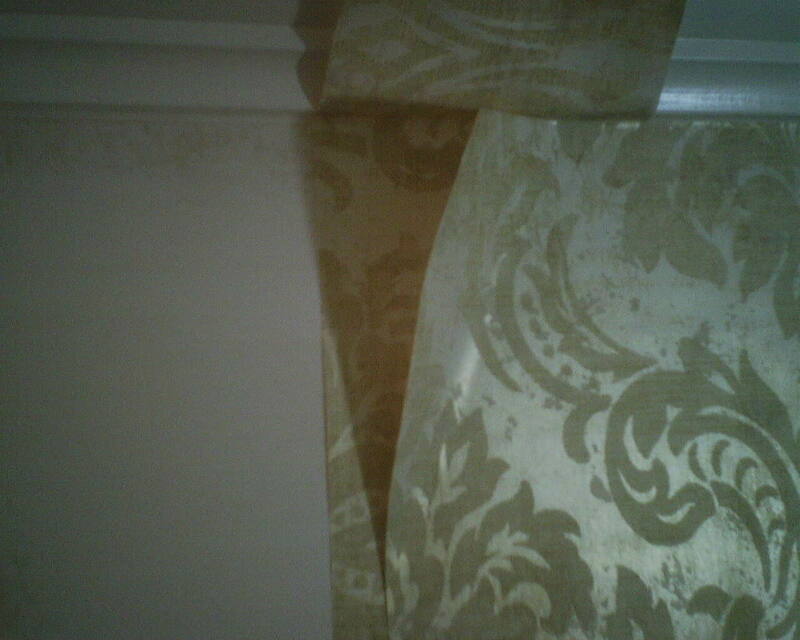 The next photo shows the two strips of wallpaper in place and overlapping, with the wall behind them protected, and ready for the splice (double cut). Instead of making an easy, straight vertical cut through the two layers of wallpaper, which would be fast and mindless, and result in noticeable a pattern mismatch, I opted for what we call an “S-cut.” Meaning, instead of making a straight, ridged cut from top to bottom, if I cut in an “S” pattern, it will be much less visible. Even better, if I cut along an element of the p0attern, such as these swoopy floral things, it all will be much less noticeable. It’s also important to use a fresh, new razor blade for this. This entry was posted on September 4, 2016 at 2:01 am and is filed under Uncategorized. You can follow any responses to this entry through the RSS 2.0 feed. You can leave a response, or trackback from your own site.